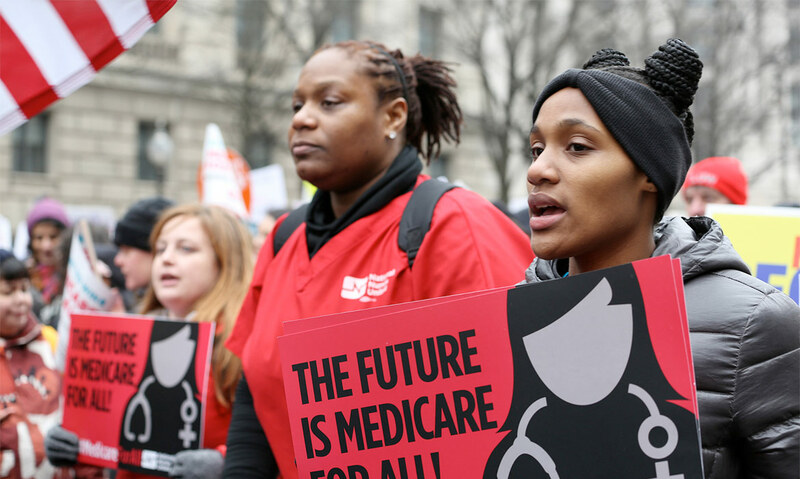 Efforts to pre-empt the growing mass movement for an expanded and improved Medicare for All by substituting instead a patchwork Medicare for some will only exacerbate the ongoing health care crisis for tens of millions of people. No one should be deceived as to the source of this campaign, the multi-trillion-dollar healthcare industry, led by giant insurance and pharmaceutical corporations, as the Washington Post reiterated January 22. In recent days alone, we have been reminded that one third of all GoFundMe campaigns are for medical expenses – a shocking 250,000 campaigns annually – the cost of live-saving insulin for diabetic patients has doubled in just the past four years, and racial and ethnic disparities in cervical cancer rates for women remain appallingly high. Limited reforms, as with the Affordable Care Act, do provide some important relief. But they leave far too many behind. Costs continue to skyrocket, access to insurance does not equal access to actual care, and a system based on generating profits will never prioritize patient need. Medicare for some plans still leave us tethered to a market driven model of health and are a placebo that will only prolong the pain and delay the care we need. What we should have learned from other industrialized nations is that it is possible to achieve genuine universal, guaranteed care for all their residents at lower cost and with equal or better health outcomes that in our broken and dysfunction, profit focused system. The barrier to real, transformative health care reform is not cost or political expediency, it is political will.